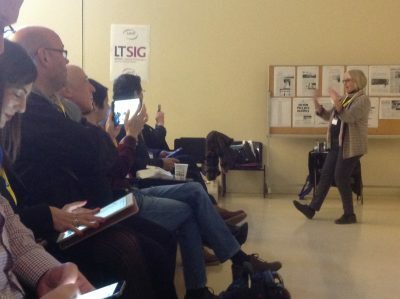 Our roving reporters, Amadeu Marin and Anna Venuto present a compilation video and comprehensive write-ups of the 5 sessions on the LTSIG strand at International House Barcelona ELT conference last Saturday, 10 February. Our roving reporters were chosen from a selection of submissions for our travel grant to attend this event in person. 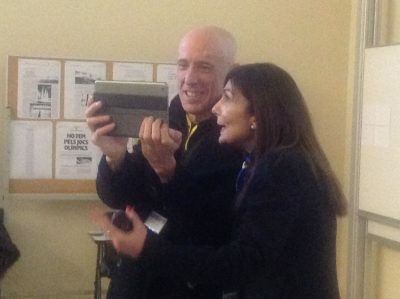 Anna handled the writing, whilst Amadeu captured the event on his mobile device. We will be offering more travel grants in future so look out for those. This is their full review of the conference, focusing specifically on the LTSIG strand. Don’t miss the interviews with all the speakers at the end! Valentina Dodge: Grab that screen! In her inspiring and practical session, Valentina not only presented various technological tools available to capture PC or mobile device screens, but also led us to reflect on the possible uses of those screenshots (still images) or screencasts (moving screen with audio) in order to create personalised materials and resources to meet our students’ learning needs. 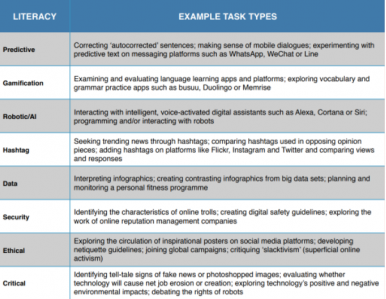 But are these tools only useful for online teaching? Obviously not; in fact, at the very beginning of the session she asked the audience if there were any teachers who were currently working online, or at least on blended or semi-blended courses, and although there were quite a few, she remarked that these tools afford opportunities for any learning context, not exclusively online. 1Jing techsmith allows you to instantly capture images and videos, share them with anyone and add basic visual elements. Here’s a tutorial on how to take your first capture using Jing. (Download Jing® for Free). 3-Snagit and Camtasia (professional software, free trial, if you want to beautify your material). Screencast Instructions to tell students what to do before coming to class, like for example on how to find and choose a video to watch before coming to class. Tutor feedback. Russell Stannard`s teacher training video, How to give students better feedback . Taking feedback beyond the demotivating red-pen model. Portfolio. A project about being environmentally friendly in which teenagers record their own screencast, which has the effect of increasing their engagement. You will have to invest on time, but get students onboard; they can make them too! 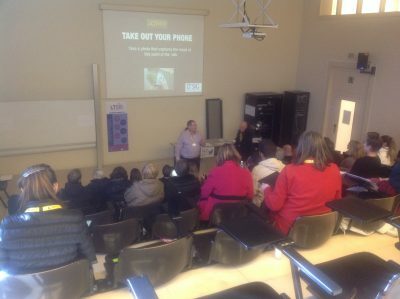 In this session, Gavin Dudeney revisited the original framework of Digital Literacies (Dudeney, Hockly & Pegrum, 2013), ‘designed to guide teachers of English and other languages in preparing their students to engage effectively with the communicative, collaborative and creative demands and opportunities of this era’, prior to a 2018 publication, in the light of ongoing technological and socio-political developments. 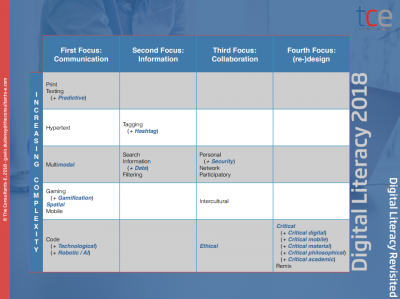 For this new publication, the original framework categories have been extended in a revised framework that takes into account our evolving context. Gavin presented the new categories, paying special attention to safety literacy (how to manage your online identity and stay safe), particularly important for young learners, and critical literacy, as nowadays more than before, it is very hard to tell what is real from what is not. 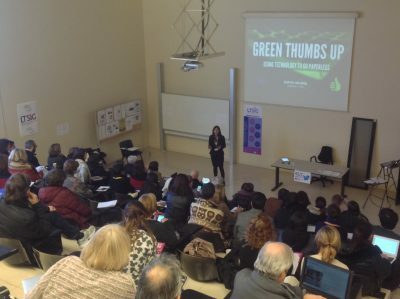 Gamification is not only about playing games, but about adding a layer of game to education. Spatial (3D spaces), augmented reality tools. Technological/robotic. It overlaps with the broader technological literacy needed to understand technological processes, and the robotic/artificial intelligence (AI) literacy needed to understand, interact with, and ultimately contribute to the design or redesign of our emerging ‘technological companions’. Data collection in learning is increasing exponentially. Data literacy is is also crucial. Critical philosophical. Our relationship with technology is getting more and more personal; this relates to the big questions posed to and about humanity as our lives become conjoined with the existence of our smart devices, robots and AI. Of course as language teachers our priority is teaching the language, but we could also slip some digital literacy insight into the lesson we teach, just to raise awareness among students, because we cannot ignore competences which belong to our daily life. Attendees to Gavin’s session were left with valuable insight into these vital competences of our time, and the new Digital Literacies Revisited is bound to address those challenges as it makes explicit literacies that were only implicitly represented in the former framework. The revised framework will sure serve as an important guide for educators, providing sample lessons as models teachers can use to design their own. It can be argued that, perhaps unconsciously, we use and probably waste, more paper than what we are actually aware of; and while the use of some paper may be necessary, reducing it could help us go lighter on the planet while saving money and time. From her professional experience and what statistics state, nowadays reams of paper are still the lifeblood of our schools. It is obvious that our education system relies too heavily on paper and this is ludicrous, because thanks to technology we could comprehensively cut down on it. As educators it is also our responsibility to educate our learners to take care of the environment. But, how can the use of technology give us the opportunity of going almost completely paperless? How can we avoid the hassle and frustration of queueing for the photocopier while choking down our lunch? One of the answers could be to start by replacing activities which involve paper and implementing a paperless pedagogy. Not just a new method of teaching but a new paradigm of learning (De Bonis & De Bonis, 2011, Warshauer at all, 2010). This new paradigm of learning aims to encourage peer collaboration, foster our students’ digital literacy, give more opportunities for language practice and promote a more organised classroom. 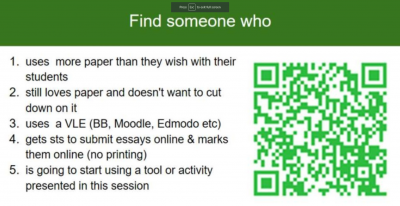 After these considerations, Sophia went on to offer a series of practical tools and steps towards a paperless language classroom. Blackboard, which she said has improved considerably but is not yet that good for interaction with students; that is why it might be a good idea to combine it with Edmodo or Moodle, the most widely-used systems. Google classroom, even if it is not Sophia’s cup of tea. Canvas, which she considered the best platform on the market today. Online writing. Getting students to write and submit essays online not only helps us reduce paper but is also more effective for students because it is easier to go back to their drafts, and they can also work together on a text without being physically together (peer editing). Google Docs interface is a bit cluttered and requires an account, but it is still the best tool when it comes to collaborative writing and editing. Zoho is totally distraction-free and very simple to use, but collaborators will need to be signed-up users. Avoid printing your reading texts. If students need to highlight or annotate a text they can use GoodReader 4. Diigo, is a great bookmarking tool that allows users to highlight and annotate webpages. The use of these tools promotes critical reading. In the following picture you can see a mingling speaking activity Sophia did, with its own QR code. A clip of this was also shared on the LTSIG Facebook group during the conference. You should cut down on the use of paper by setting realistic goals. You need to strike a good balance at the beginning, by giving students the possibility to print the material off if they want to. Unfortunately a lot of students still associate handouts with learning but it is mostly an attitude or a question of learning style, which we can deal with in class, especially if they are adults. Depending on our teaching context, we might have problems to go paperless. We are living a transitional time and it is up to us whether we want to play an active part of this transition or just keep queueing at the photocopier. In this insightful and practical session, Shaun Wilden had us reflect on the concept of student engagement and questioned the effectiveness of traditional approaches such as asking for hands-up responses to questions. If those procedures do not keep our students engaged during lessons then why don’t we try out other things, like the use of mobile phones, to keep them motivated throughout? Shaun shared a treasure trove of insights and practical ideas and activities based mostly around the concept of exit tickets for fast, on the go evaluation of learning. When do our students mentally switch off their lesson? Why? Maybe because the lesson is not that appealing, or because of the The Hermione Grainger effect, which discourages children from raising their hands, and stops their learning process as well. Statistics revealed that only the 25% of our students can be motivated by the traditional hands-up methodology and this is not certainly enough (Dudley and Osvath, Mixed-ability teaching, OUP). Only the stronger students always put their hands up, while the great majority assume a passive role, often arising from a fear of bullying as their peers resent their ‘showy’ attitude. We should find other ways to engage and motivate them, which at the same time can help us to get more reliable feedback than by using the simple hands-up procedure. The ability of engaging all the students is by far one of the most longing ones among other teacher skills, because we have to ensure maximum learners’ involvement through appropriate and varied tasks and the use of clear classroom routines, demonstrating flexibility in accordance with learners needs, and this is not obviously a piece of cake. According to Dylan Williams ‘Educators can increase the rate of student learning by integrating formative assessment practices into daily activities’. At this point Shaun considered what technology can do for us on our quest for more comprehensive feedback from the class. Through sensible use of technology we can.. He went on to introduce different practical ideas involving the use of technology that can easily be implemented in our daily classroom routine. Starting with simple activities, like using WhatsApp or other instant messaging tools (emojis can go a long way to show how a student feels about the lesson) or using email, through to more creative ideas, like asking for audio or video feedback or getting learners to grab their mobiles and take snaps that reflect their learning experience, Shaun opened our eyes to a vast amount of possibilities. Some well-known tools, such as Socrative, Kahoot, Spiral, Quizlet live, Google forms, can also be used to help the teacher to gather trustworthy feedback and reliable data during lessons. 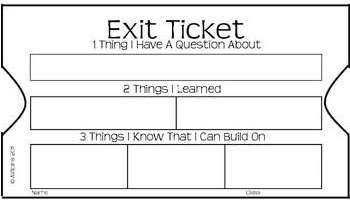 An exit ticket consists of one or two questions or problems which students are asked to answer quickly at the end of their lesson, before leaving the classroom. In their ‘analogic’ form they have been in use for a long time. By utilising mobile devices we can get faster feedback from our students, which can help us redirect our teaching and make it more personal. When combined with QR codes mobile technology can afford us very fast, effective data collection. By scanning the QR code students get immediate access to exit tickets we want them to complete. At the beginning, using technology to gather student feedback will require some time investment, but then we can recycle and clone the exit tickets we have created. And, of course, depending on our teaching context, we might also have to strike the right balance between the use of technology and the ‘hands-up approach’. If you want to know more about how to set up mobile activities, you can read Shaun’s latest book Mobile Learning (2017) OUP Oxford ISBN: 978-0194200394. In her practical and lively session, Barbara Gardner got us to experience and practise designing questions that help you to decide what to do next in class. This kind of questions are also known as ‘hinge’ questions; because they open the door to the next stage of learning. 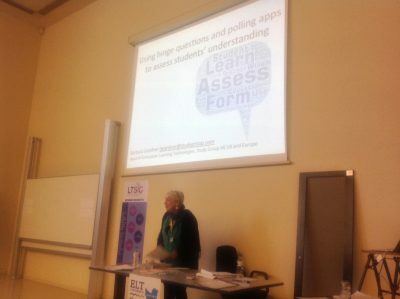 She discussed various feedback tools and mobile device apps, like Plickers, Kahoot, Meetoo, Padlet, Smart Response or Socrative, and then went on to introduce activities involving the polling app Poll Everywhere. We reflected on how this can help teachers engage every student, be more responsive to their needs and benefit from seeing responses from the whole class. Barbara discussed concept check questions,a tried and tested type of concept checking procedure that has been used extensively for a long time (here you will find quite a comprehensive slideshow). Concept check questions promote an active learning and assessment for our students. The key moment is to know if we can go on or we need to go over again something. Make sure that you are specific about the meaning. Avoid the target language in the questions (grade the vocabulary and structures that you use below the target language). In a class survey students were asked to choose what way they preferred to answer CCQs, and they picked out online quizzes because they felt under pressure when holding up a card or stick to answer. Barbara believes we can enhance our students learning experience by using technology, for example by using some poll apps to gather students’ responses. 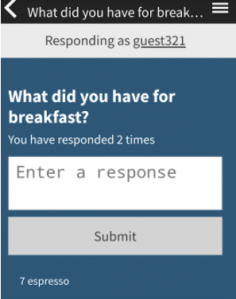 Among other free apps, Poll Everywhere is an application that works well for live audiences; the use of mobile devices can help us gather reliable information from our students, very quickly. Keepy-Uppy. Like a footballer keeps the ball up in the air during a training session, the teacher can produce the same effect by digging deeper, keeping momentum and asking things like What could you add to that? Would the same answer apply if…? What evidence is there for that response? Pose, Pause, Pounce and Bounce. Another way of keeping the questions going on. Pose: teacher poses the questions; no hands up. Pounce: nominate a learner to give the answer. Barbara finished the session with a lovely ‘mexican wave’ activity (see the Sessions video) in which participants in pairs shared one or two ideas they were going to take home with them from the session. She passed her raised hand across the room pairs had to speak or remain silent. A beautiful, holistic take on feedback questions. Barbara’s slides can be found in a shared Google Drive folder. I was born in Sicily and I got my degree in European Languages and Cultures (English, Spanish and Italian) at Catania University in 2007 and a Master in Applied Linguistics to EFL, in 2010. 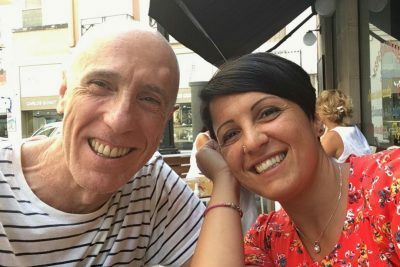 I’ve been working in Spain as a curious, committed and passionate English-Italian teacher since 2009, both at private and state-run schools. I’ve been a member of LTSG and IATEFL since 2015. 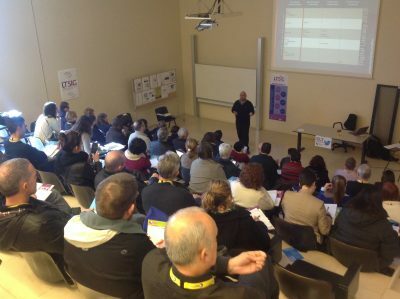 Currently I am working at the EOI in Castellón, where besides teaching, I have also started teacher training courses for my colleagues, on blended learning and EdTech tools which can support meaningful projects to promote students’ agency and alternative assessment. I’ve been in TEFL for over 30 years. Apart from my teaching and managerial work at EOI Castelló, I also train locally and run an EdTech summer course for Pilgrims. I’ve been a member of the LTSIG and IATEFL since 2015 and presented workshops at the 2016 and 2017 annual conferences. I regularly use EdTech, have an ‘unplugged’ teaching style, take a lexical look at language learning, and have always believed that empowering the learner is essential for the success of the learning process.